customs clearance of the car - it is a mandatory procedure which accompanies the transport of cars across the border. Although this is a rather narrow segment in the field of customs clearance, it is in great demand due to the prevalence in the first second-hand cars. The customs clearance of the car has its subtleties and nuances and customs clearance itself is regulated by special government decree. For Russians, buying a car abroad is quite common. This is primarily due to the fact that the cars from abroad much cheaper than similar models in Russia, especially in the cars with mileage. In addition the quality of both the roads and help keep fuel cars in excellent condition abroad. But assessing their costs to buy a car abroad, it is essential to take into account the fact that you will need to customs clearance cars, and this additional cost. To the car owner can enjoy his car in full, rather than turning it into a property, you need to clear of the machine correctly. First of all it is necessary to consider that the import of machines, intended for personal use will be subject to some customs tariffs, for resale by others. Different calculation methods apply to legal entities and individuals: for the second customs clearance will be much more expensive, if they are not going to use the vehicle for personal use. Note that at the moment the car customs clearing procedure does not depend on the method of entry into the territory of the Russian Federation. From 1 to 3 years. From 3 to 5 years. Displacement and its type (gasoline or diesel). It should be borne in mind that the customs clearance of the car, whose age is older than 7 years will be an expensive pleasure, paired with a number of problems. Customs clearance of a new car , and according to the rules of this machine, from the date of issue which was not more than three years, provides for payments that depend on engine size and cost of the car itself. When customs clearance of a new Russian-made cars imported into the country from abroad, there are several different scheme - 1 euro per 1 cu. cm. engine size. Special attention is given the customs clearance of trucks. In this case, in addition to the age of the machine will be considered as the capacity of such option. There will also play a key role type of use of the vehicle: for personal use for commercial or industrial activities. In the last two cases will be subjected to the payment of so-called total customs duty: customs duty, excise duty, VAT and customs clearance. Size duty rate will depend on the code of the injection pump, and excise tax value determined based on the engine power, measured in horsepower. Note that when customs clearance of trucks produced in Russia, the same will apply uniform rates of customs clearance cars, but rather a single rate - 1 euro per 1 cc engine size. Thus, in our country a preferential customs clearance of cars for individuals and for cars of Russian production, imported to Russia from abroad. Of course, to understand all the intricacies of the customs clearance of cars is no easy task. Correct filling of all papers, accurate calculations - all of this is the urgent need to reduce the customs car cleaning period. Besides customs clearance vehicle to a person ignorant can turn into a huge list of requirements of customs officials and the terrible red tape. If you use special customs brokers, we can avoid many mistakes, get advice as to clear of transport, as well as significantly reduce its costs of customs clearance and save a lot of productive time. But then another question arises, where to find competent in these matters of customs broker? The best assistant in the customs clearance of cars in Vladivostok - a "Customs Brokers Association." For more than twenty years, we provide services for customs clearance , and have extensive experience in the customs legalization of cars. 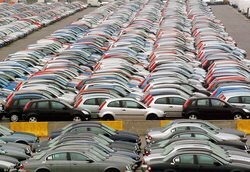 Our experts are well aware of the situation in this area of the market and constantly analyze the customs value of imported vehicles. "Association of Customs Brokers" sets a minimum price for their services, as it has a large number of clients and works so professionally that successful existence on the market of these services we do not need excessive tariffs. Someone thinks that it is dumping, and we believe that this is the right professional approach to their activities and human attitude to their customers. If you require customs clearance of cars from Japan, please contact us. We will help to legalize the car as soon as possible, we choose the best mode for calculating customs duties, and soon you'll not only the rightful owner of high-quality Japanese foreign cars, and will enjoy the trip on this car. We value your time and offer you avoid losses - just shift all the care of the customs clearance of vehicles at us. "Association of Customs Brokers" will be glad to see you as a customer!